What are some fun ways to encourage a toddler to put their toys away? Raising a toddler seems to appear fun and exciting since you get to have a “little adult” companion in your home. Toddlers are natural followers, especially when it comes to household chores that adults do every day. They love to participate in cooking, washing the dishes and doing the laundry. On the other hand, parents of toddlers would agree that when it comes to putting their toys away after play time, it seems to be the hardest job ever! And worse, they may throw a tantrum if you insist that they ought to be responsible for their toys. Sounds pretty stressful, isn’t it? For toddlers, cleaning up their toys appears to be a difficult task. They love playing and messing up the whole room but apparently, they’ll say they are already too tired to put their toys away. So let’s say you give in to their plea today. Well, you may have to get your nerves ready, since they’ll use this excuse EVERYDAY. Some experts say that toddlers see their toys as an extension of themselves. They often like to leave their toys where they’ve left them, so that they can play with the same toys again the next day. This idea may be reasonable enough for toys that are inside a play room, but this may not be acceptable for toys in the other areas of your home like in your bedroom, kitchen, living room, or even in your bathroom. Scattered toys are not appealing to the eyes and at the same time, they are potential hazards for slip accidents. Well, this one’s pretty obvious. Just the idea of cleaning up the whole room with toys that are scattered all over is too overwhelming for a tiny kid, especially if he knows he’ll be doing it alone. He might not want to spend the entire afternoon cleaning things up and end up asleep on the floor instead. Most parents would agree that toddlers get a sudden energy boost when you mention the word “play”. Create a fun time while ensuring that they help in cleaning up. For example, get their empty toy basket and start shooting toys in it from a distance. Tell them you’re going to play “basketball” but you’ll be using the toys as the balls. While you’re having fun tossing the toys in one by one, the little tot is enjoying as well. What’s more, he will not realize that he has put all the toys in the basket in no time! 2. Let’s Do The Magic Trick! This one’s a sure hit and would highly likely get your toddler’s attention! Toddlers love stories, they love it A LOT! So you can make up a story that tells of a magical house that cleans itself up when the mom says so. You may apply reverse psychology on your little child by saying, “I wonder if our house has magic powers too” or “I hope I could also experience living in a magical house like in the story”. You’ll be surprised that when you get back, the toys are all in place and your toddler wearing a big smile in his/her face. If you’re good at making up nursery rhymes then you may opt to make one specifically for cleaning up! You can also get song ideas from children’s shows like Barney or just browse online. Match the song with some dance steps that incorporate sorting and picking up things and putting them into baskets. It will surely delight your toddler and is a great way to make him/her participate in the cleaning process, without him thinking that he is actually cleaning! There are lots of fun ways to teach our young kids the value of cleaning up. Being firm and authoritative may be necessary, however, there are also times when we need to use a little creativity and minimize the tension between us and our little one. If you can do things the fun way, then why not? The most important thing is that we have introduced the good values to our kids in a less stressful way. Toddlers can be hard to deal with. I have a toddler sister that spends most of her time making a mess in the living room with all her toys. I always get to stay with her the whole day and since I am 18 years older than her, I watch her during the day. What I do is I’ll introduce her to something that she thinks is better than toys at the moment, like foods, or strolls. Sometimes it works, sometimes it doesn’t. I want to try the challenge game which I think will work on her. That’s really nice of you to look after your younger sister. I’m sure it greatly helps lift the load from your mom because toddlers can be a real handful. Taking care of her is also a good way to bond with her considering your age gap. I’m sure it’s not easy but when she finally grows up, you will be someone she would really look up to. It’s a special bond. Cherish it. Same thing with my youngest boy and her two younger sisters. They have a six to eight years gap. My youngest boy has watched over his sisters when they were growing up., and that bond exists up until now that his sisters are a bit older. They have a closer relationship as compared to that with their two older brothers. I think I might skip the singing part since the kid could possibly throw tantrums if he hears me sing! Personally, I only thought the first one, the rest are very helpful and fun ideas. As a parent you have to think more fun solutions since they can get used to it over the time. Yep! A story, Incorperating a story is a great way with a twist of some props like having some treasure chest to be a storage, and him being the super hero to protect and have to hide his toys from the bad guys. I think that is fun as well! Haha! Nice one there about you singing. Yes, a treasure chest as a toy storage sounds like a good idea! You can tell your toddler a story about pirates and him being the hero who defends the treasures from the pirates by stashing them somewhere safe. I’m sure he’ll love it and would voluntarily pick up and keep his toys in the treasure chest. Sounds really interesting reading the funny ways parents can make their kids clean up their toys after playing with them. Mom always use the trick of challenging me to see who will put most of the toys in the basket while I was growing and I must say that it was an awesome experience back in the days. I’m of the opinion that, if parents can adopt these steps in ensuring their kids clean up the toy mess after a play in that funny manner and with no fight whatsoever, then everyone will be happy doing what they suppose to do. It’s actually the high sense of attachments these kids have towards their toys that makes it very hard or difficult for them to do away with it without crying or feeling bad. So therefore, in order to find a way to makes them enjoy putting their toys away without feeling bad is why finding a way to get them putting these toys away in form of playing exercise. I remember when my sister was still very little, my mother would hide away toys for one week. So my sister would search the next day and my mother would lie that a monster stole them. Then my mother would bring them out after some days. She would then tell my sister that if she didn’t want the monster to come and steal again, she should hide the toys before going to sleep. That sounds like a good story to motivate the child to keep his/her toys. I will remember that for the future when I have grandkids, haha. It’s really difficult to keep the house in order if there are kids around. My younger ones are already 8 and 10 years old but the house is often still a mess when they play or do some arts and crafts. And I guess it is more challenging now to encourage them to tidy up because they now understand a lot of things and would no longer believe that a pirate or monster will steal their toys if they don’t keep them, haha. Yes indeed that toodlers create a sense of attachment to their toys. My daughter is now almost 11 years old but her favorite toy is still the same since she got it on her first birthday. Would you believe that? Sounds ridiculous but it’s true. She always tell me everytime I convince her to give it away because it looks old already that “it’s my friend” maybe she’s the only child that’s why she have this attachment to that dolly. Creating a game challenge is toodlers all time favorite. Just make sure that you will loose otherwise they won’t play with you anymore. As they grow up try to discipline them in accordance to their age and the way they better understand. Some might quick adapatation to changes some may takes time but no matter what in every individual there’s always a place for childs heart. You’re so right about letting a child win in a challenge game. If you don’t let him/her win, he/she will no longer play with you next time, haha. This is one good point to remember. Toddlers want to feel they’re on top of the game so make them think that they are. I’m sure they’ll try beating you again in the next challenge game, which means lesser toys for you to put away. Ah, the “clutter stage”. No house is ever organized if you have a small kid around. Try as you might, you will only get frustrated so you might as well get used to it for now , but soon, when she can already walk on her own, you can start training her by utilizing the tips mentioned here. It’s also a great way to teach kids to become organized, helpful and responsible 🙂 Good luck! This is really an interesting article and I definitely believe that the first tip on converting clean up task to playing time is going to prove successful in getting these young one to pack up their playing toys without feeling the burden of doing so, as they would actually be viewing it as they are playing instead of working. Kids can never get tired of playing unless when they are hungry or sick. So getting to wire some of their daily tasks in form playing activities is going to be pleasing to them and helpful to the parent as well. Yes, Martinsx, tapping the child’s interest with playtime is the best technique to make a child help with cleaning up the mess, ha ha. He/She will never know he/she is actually putting the toys away because for him/her, it’s still playtime. And since kids love to play, they’ll have the energy to keep doing it, while you save some of your energy. Doing these tips will also tire the child and you’ll have no problem putting him/her to sleep later on. That’s hitting two birds with one stone. Haha @Elsa, this is absolutely true, kids easily dose off once they are worn out from playing. I have actually found out it’s no need trying to be too strict with the sleeping pattern of toddlers. Just allow them play, once they are tired it’s sleep that would be the next thing. So there is no need getting worked up in forcing them to sleep. I have so far been impressed with the quality and interesting articles I have come across ever since I joined this blog community, I have learnt so much in such a short period of time. All I can say is that you guys should keep up the good work because it’s been helpful to most people here. I love the idea of creating a story centered around a magic house! I’m a librarian and used to do toddler storytime programs and honestly hadn’t thought of the idea of using or creating a story that might inspire cleanup. That would actually make a great theme for a future storytime program! Music is a great idea too. I remember as a kid having preschool teachers that would encourage us to clean up after playtime by playing the Clean Up song from Barney. You could probably even play it on loop (you can find videos of it looping on YouTube) until everything is put away. We’re glad you learned something new from these tips, ecole11j. You could surely use one or two of these tips in the future. Thank you as well for sharing the use of music like Barney’s “Clean Up” song. Kids love Barney and they could surely relate to the music and be motivated to clean up. That’s interesting , Definitely believe that the first tip on converting clean up task to playing time . 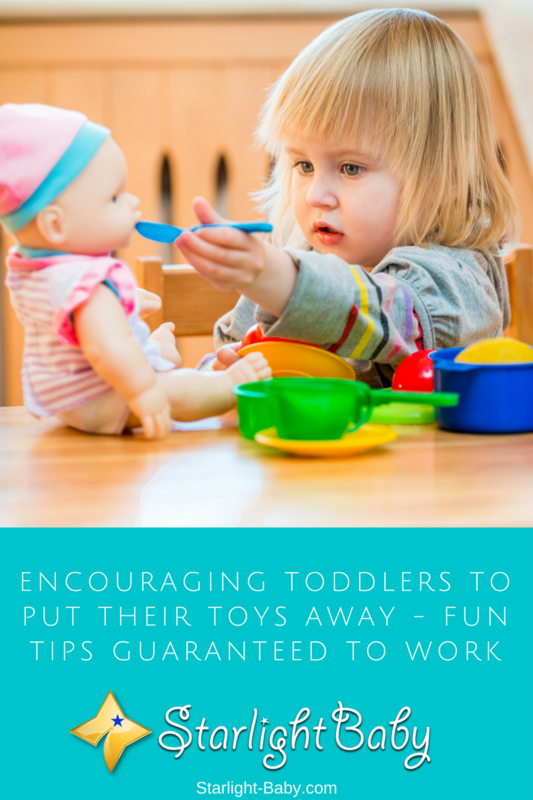 Yes, I do think this is one of the best tips because it would still feel like playtime for the toddler so it would not be difficult to ask him/her to play along. I would say this tip would also help put the child to sleep without much struggle because he/she will be exhausted from the activity. That’s shooting two birds with one stone as they say. I am yet to deal with this because my baby is too young to play with toys. However, I have observed my sister deal with this issue with her toddlers. One of her hacks is to divert her children mind. When the children are busy with the toys, she will introduce a new thing, for instance, juice, chocolate. This easily diverts the children and they will leave the toys immediately. Diverting children’s attention is also a good way to get rid of the kids so you can put away their scattered toys, haha. As for me, I often do the cleaning when they’re already tucked in bed. Oh well, it’s a never-ending clutter if you have toddlers at home. I don’t know which is favorable to me sometimes, me tidying the toys quietly or the toddler that I need to keep on reminding her to put away her toys after she’s done with it until I need to motivate her or the worst is to shout and scold her. You really needed a lot of patience when dealing with children, where can I buy that, I need a ton of it. They are still kids and they really love to play even us adults we like to play. But then they need to be responsible, they have to learn early. Train well and you’ll see how good they are. For me, being creative and making the cleaning fun is okay if you have a lot of time but when all you have to do is check on the clock just to get into your schedule, then you just really have to choose the me, tidying up quietly so it is more faster. It is so funny sometimes, I don’t know if its funny or irritating because when you tell her, “please put away your toys” she will follow and start tidying up but when she sees some other nice toys and in the middle of tidying up she’ll forget and start to play again. Whoah! We’re fooling around here. Hopefully it’ll get better in time. Good luck to us. Mochi88, I still haven’t found the store that sells tons of patience, haha. Asking kids to put away toys is like asking a husband to regularly help in household chores – you need to get mad first at times before they comply. And yes, sometimes it’s just faster and less stressful if we do the tidying ourselves. I think one of the hardest thing that a parent need to teach the toddler is to clean their own toy or put back the toy into the shelve. We are teaching my niece and nephew to clean their toys after they play it, it is really hard because sometimes they want an exchange first before they’ll do it (exchange like candies,Ice cream, etc.) But for me it is wrong because we should teach them to clean their mess even though there is nothing in return. But I will admit that as their uncle, it is really hart to teach them. Yes, you’re so right. Kids would often expect something in return when they tidy up – “Okay, I’ll clean up but buy me an ice cream”, that sort of thing. Yes, it doesn’t have to be that way. They should learn about being responsible. Oh well, I guess that is one of the hardest things to teach kids – to be proactive, helpful and considerate; to do something without being told.